The earliest known resident of the house is Albert Wilkerson in 1907. Wilkerson was a contractor by trade and is believed to have constructed the house himself. I was hoping you would do a piece on this house. I'm glad to see that the people have restored this quite nicely. It's one of my favorite houses on Buchanan from Main to Chapel Hill. The house on the other side of Burch x Buchanan was recently painted a nice green. I wasn't expecting it, but it fits ratherly nicely. Much better than the way it looked a year ago. I remember as a young boy going to this house. It was the home of two elderly sisters who were members of Duke Memorial Church. I am not sure if they were Wilkersons or not. Their longevity may have had a lot to do with the fact that the house still stands. Is Albert Wilkerson related to Ernest Wilkerson, a prolific builder in the 1950's? Thank you for providing some history on that house. I've always liked the Burch Avenue Neighborhood. Great people, a close proximity to downtown, and the architecture on Burch and Wilkerson Avenues make this one of my favorite areas in Durham. The house at 508 S. Buchanan Blvd. was built by, and the home of my great-grandfather Albert Earnest Wilkerson. My great-grandmother, Mary Parthenia Newton Wilkerson lived here until her death in 1957 at the age of 100. My great aunt, Minnie Wilkerson Delamar, moved back to the home in 1932. She died in 1988. The home was then sold by the Wilkerson heirs. MY grandmother, Maude Wilkerson Dunn, moved back to the home around 1952 after retiring as parincipal of North Durham Elementary School. She maintained two greenhouses and a garden in the back yard from which she sold flowers and plants. She died in 1985 at the age of 100. A third sister, Ruth Wilkerson Swain moved back to the home after her retirement from North Durham School, and lived there until her death in the 1970's. Ernest Wilkerson was a son of A.E. Wilkerson. Much of my rearing was here at what was then 508 Milton Ave. I came back often to visit my grandmother and great-aunts. I have many fond memories of this home,the neighborhood, and the time spent here. Albert Earnest (A. E.) Wilkerson was his eldest son and worked with his father, and became a contractor. 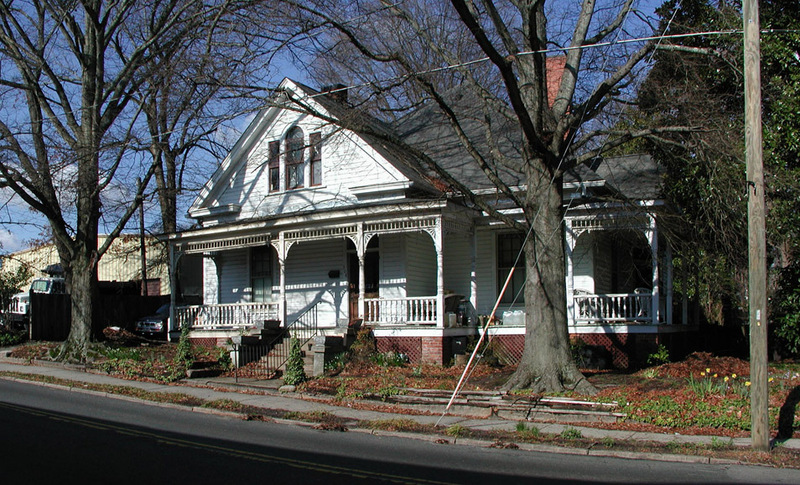 One of my favorite houses in Durham, the Albert Wilkerson house, was built around 1910 by Albert Wilkerson, one of the first Durham building contractors who had earlier lived on what became Wilkerson Avenue (named after him.) He built this house after the earlier structure was destroyed by fire. Wilkerson is known to have built Washington Duke's home Fairview and the Epworth Inn on the Trinity College campus. Despite the very unappealing commercial strip just north of this structure on the north side of West Chapel Hill St., this structure remains seemingly intact. This one-story, Queen Anne-style house is three-bays wide and triple pile. It has a high, hipped roof with projecting bays on the front (east) and right (north) sides. A highly decorative porch wraps around the front and right sides of the house, supported by turned porch posts with Queen Anne-style brackets, a spindle frieze, and a turned porch railing. The front door is a multi-light-over-panel with some colored glass panes and features a matching transom. The projecting bay on the north side of the house has canted walls and a second entrance from the porch. The house retains original molded wood weatherboards and twenty-four-over-two wood windows. A Palladian window is centered in the front gable. The earliest known resident of the house is Albert Wilkerson in 1907. Wilkerson was a contractor by trade and is believed to have constructed the house himself. 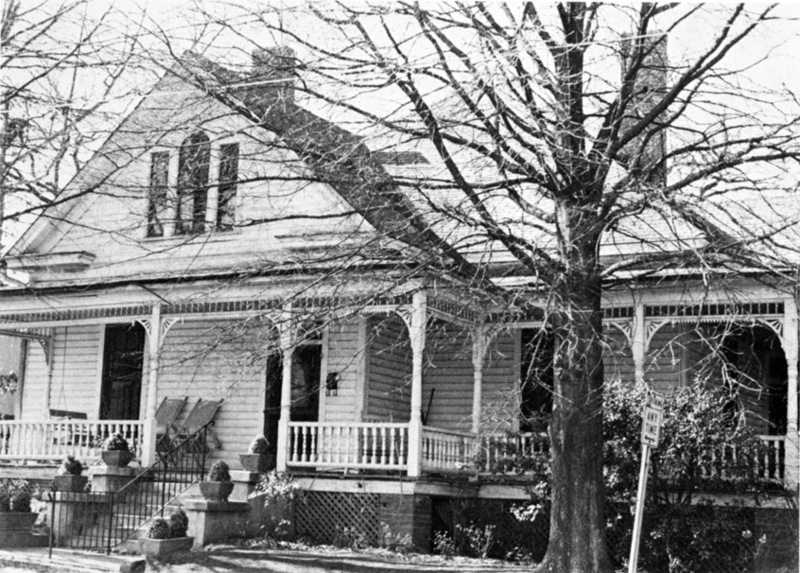 The Wilkerson family lived in the house through at least the 1940s. Durham doesn't have many single or 1.5 story Victorian/Queen Anne structures with anything approaching this level of detailing. I'm thrilled that this one has survived.